A beautiful 14 kt modern yellow gold ring with 1 round brilliant cut diamond, est.0.27ct (SI2 clarity: I-J colour); 2 straight baguette diamonds, est.0.59ct (SI clarity: H-I colour) and 44 round brilliant and single cut diamonds. est. 0.81ct (SI-I1 clarity: H-I colour). 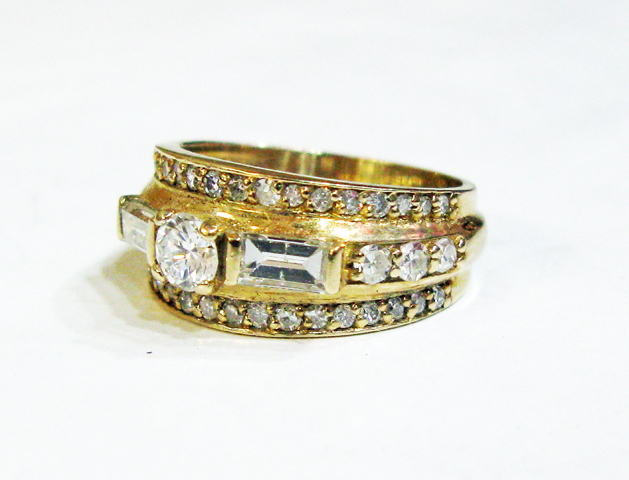 It is one solid ring with the illusion of a center ring and half eternity bands on each side.